My boys, specifically Nathan, love STAMPING! Nathan requests it almost daily! We have several Melissa and Doug stamp sets that we love! He loves making “art” with them. There are all sorts of themed sets: Animals, Dinosaurs, Horses, Princesses, Vehicles, Landscapes, Friendship, Butterfly, Baby Zoo, and Baby Farm But, now that Nathan is getting older and learning all his letters and sounds, I wanted something for him to be able to practice them, as well as stamping his name and other words! We got the Melissa and Doug Alphabet Stamp set a while ago and he has loved stamping letters and his name. But, he still has a few letters he will get mixed up on and so I wanted him to keep practicing them. 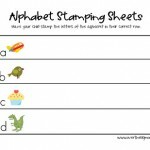 So, I created these Alphabet Stamping Sheets! While he stamps the letters I have him work on saying the letter name and letter sound. We also say words that start with that letter! I also created a blank page at the end of the download, so he would have a place to stamp his name and work on other words too. He likes me to write out all his cousin’s names and then he copies them by stamping them. I have started to ask him what the first letter of a specific cousin’s name is, by having him making the starting sound of their name. Then, once we get that, then he’ll just copy the rest. 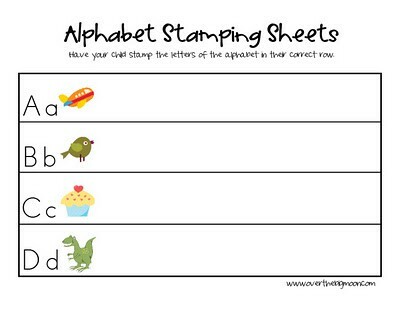 My sister, Jamie, even purchased a set of Alphabet Stamps after seeing our set to use with her older kids. She has her Kindergartner stamp out all his spelling words and then if her 4th grader is having a hard time on a word or two off her spelling list, she’ll pull them out for her to use too! It forces her to slow down a little and really memorize the word, cause she has to take the time to pull out each specific letter! I have been super happy with the Melissa and Doug ink sets too. 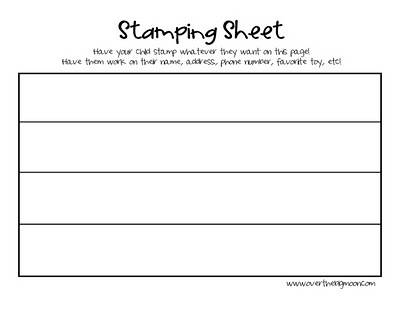 My boys especially love the Jumbo Stamp Pad! Makes it easy for lots of little hands to get involved without fighting over the ink pad! Happy Stampin’!! Thanks so much. 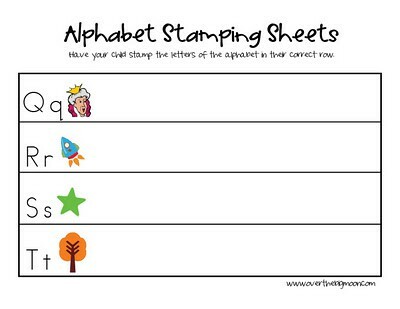 My students like the alphabet stamp set, but have gotten tired of doing their names, so between this and some word themed stamping, I think new life will come to the stamping center. My little guy is still a little young for this, but I’m pinning it for when he’s older. Thanks for sharing! this looks like a fun learning activity… thanks for sharing! !